and covers to warm up the night. and covers to cool off the summer night. In front of Gallery Row in Lambertville (between 71 and 75 Bridge street). (between 71 and 75 Bridge street). Let your heart open and your spirit soar. 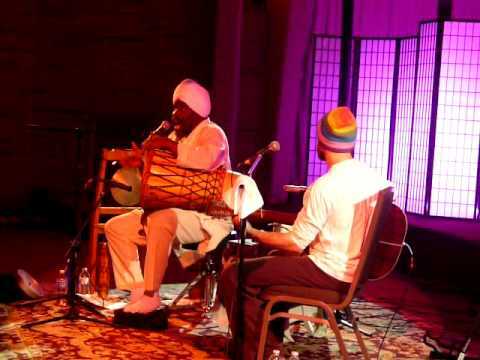 SiriOm’s music combines mantras from many traditions with church hymns, spirituals, sacred texts and original lyrics with music that is inspired by Jazz, Gospel, Reggae and Folk. It reflects his deep respect for all spiritual and religious practices, and honors them all as different paths to celebrate peace and the human spirit. His original lyrics reflect his commitment to peace and social justice. Join SiriOm in chanting mantras from his albums Travel The Light and GuruDev at the Community Wellness Day of the Healing Arts Collective in Philadelphia. Come for the day and enjoy yoga classes, massage, acupuncture and more, and stay for the music.